We Came Whirling from Nothingness (2014) by Charwei Tsai. Image courtesy of CFCCA and Michael Pollard. In the main gallery of Manchester’s Centre for Chinese Contemporary Art (CFCCA) space, Taiwanese artist Charwei Tsai presents her first UK solo show Bulaubulau – a selection of drawings, photographs and films which embody Tsai’s ongoing research into the sustainable living of Taiwan’s indigenous communities. 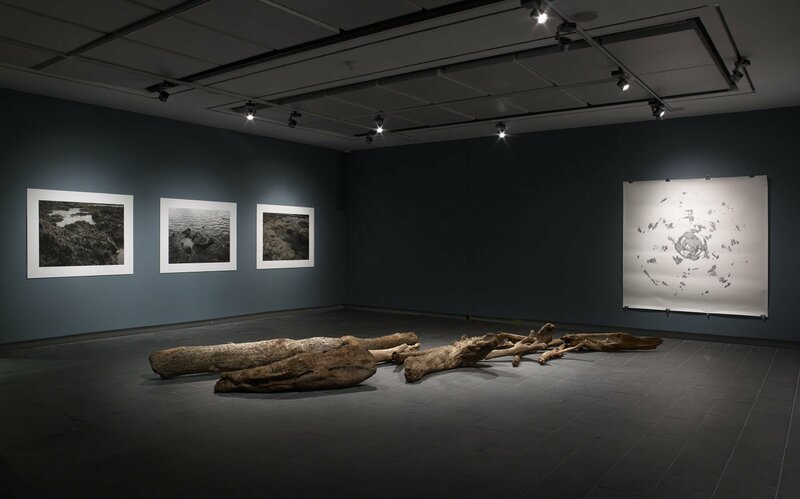 Tsai’s exhibition forms part of the CFCCA’s programme “A Season for Change”, which explores contemporary responses to the urgent global environmental crisis coming from Chinese artists, and those engaging with Chinese culture. Bulaubulau sits alongside another exhibition, Hong Kong Soup, complementing eachother in the ecological programme. Tsai’s works revolve around her interest in the symbiotic human-nature relationship, epitomised by a traditional way of life which depends on natural resources from the land and sea. Bulaubulau (2018), the title work in Charwei Tsai’s exhibition, is a new film which takes its name from a remote village in Taiwan. The film explores the how the community have fused modern and traditional practices to create a sustainable way of life on their ancestral land. Students at the grassroots Root Vocational School are supported to upskill for future employment, whilst learning to engage meaningfully with their land, heritage and culture. The film shares a hopeful example of progressive problem solving, and is juxtaposed against Tsai’s earlier film Lanyu – Three Stories (2012). This piece provides a window into the Tao tribe through three poetic visual essays, two of which depict rituals which speak to their reverence to the sea – asking for safe passage and the return of lost loved ones. The third, entitled Lanyu Seascapes shares the desperate plight of the island in light of recent nuclear waste dumping which is poisoning their livelihood, with narration set poignantly against footage of Lanyu’s sublimely beautiful coastline. Driftwood (2011) by Charwei Tsai. Image courtesy of CFCCA and Michael Pollard. This landscape is explored further in a photographic series Lanyu (2012) which depicts the island after a devastating typhoon. Hidden amongst broken rocks, waves and disturbed algae we find hand-scribed Chinese calligraphy from Heart Sutra – a well-known Buddhist scripture which uses a water-crossing as a metaphor for the acquisition of wisdom. Tsai repeats this motif with her other works in the gallery space; Driftwood (2011) in which the Heart Sutra is inscribed onto driftwood from the storm; and a drawing series on rice paper We Came Whirling from Nothingness (2014), which uses the religious text to create dizzying spiral patterns which gradually disperse into a void. In Buddhism, meditations on the concept of Emptiness are tied closely to an understanding of the interconnectedness of all living things. When applied to climate change, the wisdom of the Heart Sutra is that the fates of humanity and the natural world are inextricably linked, and that it would be a terrible mistake to destroy that relationship. 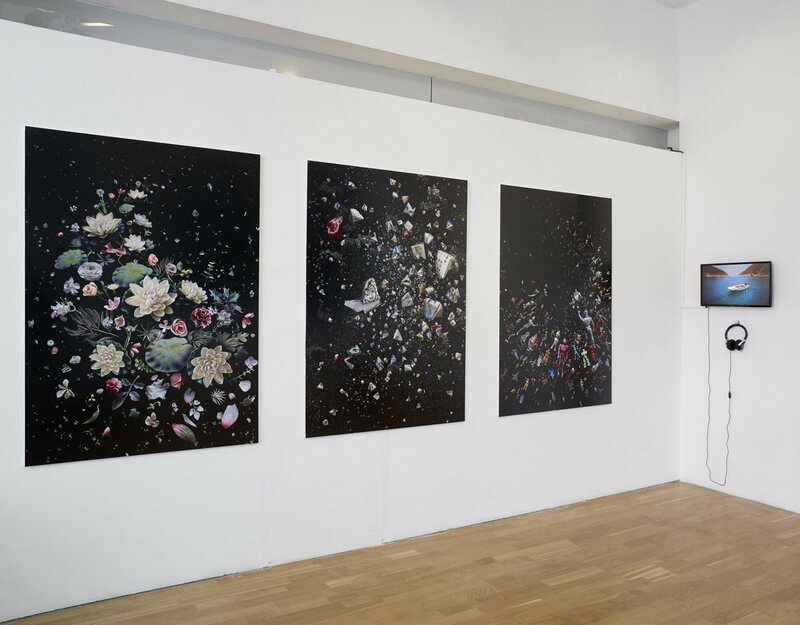 Mandy Barker’s photographs in the window gallery space are the crisp facts to Charwei Tsai’s flowing poetry. Whilst beautifully realised, on closer inspection these images become quickly disturbing. 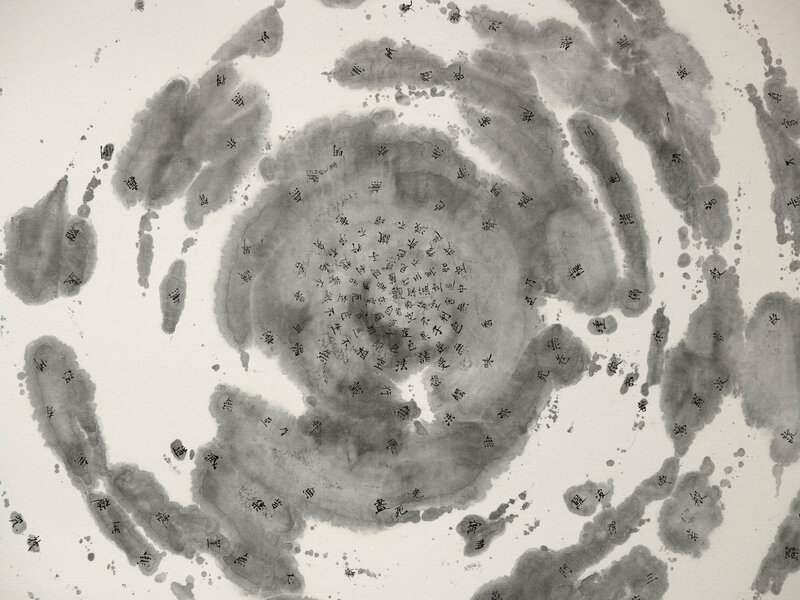 For Hong Kong Soup Barker collected and photographed waste debris from over 50 beaches in Hong Kong, creating unsettling digital images compositionally reminiscent of vast galaxies or microscopic lifeforms. The debris, which have escaped from ineffective landfill or recycling processes, travel into the sea and then wash up on beaches. Recognisable household, retail, agricultural, medical, and hazardous waste objects are interspersed with thousands of smaller fragments and particles which damage biodiversity and enter the food chain. In Hong Kong the pollution has become so commonplace that it is colloquially referred to as ‘soup’. However, the issue of marine plastic waste is not confined to Hong Kong, and these photographs are an alarming visual reminder of a global environmental issue. Barker works with scientists around the world to develop her work and to ensure that the images communicate current research accurately. As a result the message is uncompromisingly clear – the human race’s love affair with plastic is over. The combination of these two exhibitions makes for a compelling argument that art can bring a radical new perspective on climate change. Whilst their space in Manchester’s Northern Quarter may be modest compared to some of the cultural giants in this city, CFCCA has a growing reputation for thought-provoking and rigorous curation, and ‘A Season for Change’ is no exception. Hong Kong Soup by Mandy Barker. Image courtesy of CFCCA and Michael Pollard.